Get to know a day in the life of a Consilio expert. How we think and act. 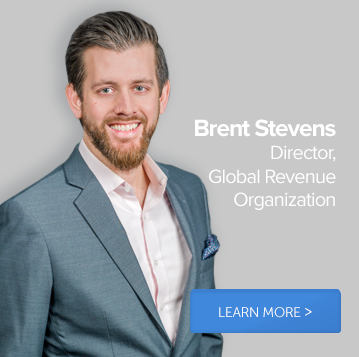 Brent Stevens, Director, tells us what it’s like to work in Consilio’s Global Revenue Organization. Which department do you sit in, and where are you based? I work in the Global Revenue Organization and have been working for Consilio for four years, based out of our office in New York City. So, what is a typical day like for you? My day starts by catching up with our APAC offices to make sure I’m up to speed and respond to any requests before their day ends on that side of the world. I’m the relationship lead on over 100 projects, many of which are being managed globally, so I have a lot of team members and clients to look after and make sure they’re happy and on track. I also need to find ways to add value to my clients and prospective clients by providing presentations, proposals and market research. My overarching goal in my role outside of the day-to-day is to grow the business and bring in revenue on a global scale. What skills do you need to excel in your department? The four most important skills needed for the Global Revenue Organization are organization, problem-solving, teamwork and having a long-view mentality. I need to be organized because of all the projects and jurisdictions I work across, so I need to prioritize effectively and manage everything that is happening at the same time to avoid becoming overwhelmed. Being good at problem-solving is very important in a client facing role. Our clients often have an idea of where they want to take the case and their ideal outcome, so we need to advise them on what to do. Teamwork and having a strong team mindset is very important for successful engagement with clients. We wouldn’t be as successful as we have been in this department if we solely focused on our individual goals; we must work together to serve our clients well. Having a long-view mentality is crucial for success in the future. You must be thinking about the bigger picture when talking to everyone. What is the most interesting part of your role at Consilio? I have been doing discovery for close to 13 years, and it can largely become a bit mechanical and process driven for the majority of matters. However, being able to diagnose needs from my corporate clients and introduce members of my Law Department Management consulting team has been extremely interesting for me. One of my favorites is utilizing Sky Analytics to help clients better assess their outside counsel spend and overall how they can be more efficient and cost effective. There’s a major push with in-house clients on how/where they can save money and bringing real benchmarking data to the conversation creates a lot of excitement. It’s a great change of pace to help clients save money, as opposed to the required pain of discovery costs for matters. What is the most challenging part of your role at Consilio? I would say having a work-life balance you are happy with is the most challenging aspect. Working for NYC lawyers, for example, requires you to live at their pace and it can be testing sometimes, but it’s part of the job. You’re an essential part of the case team so if that means staying up nights and weekends, that’s what needs to get done. However, to make it easier for myself, I make to-do lists. That way I can designate tasks with high priority to certain days to ensure I can get them done in time and still see my family. What has been your greatest accomplishment thus far? Before coming to Consilio I’d worked almost exclusively with law firms, dealing with smaller, project-based requests within matters. As a result, my viewpoint was quite narrow with understanding the big picture of the matter and was really only relayed what the law firms passed on to me. What excited me about Consilio was its impressive list of corporate clients and their Law Department Management group. This has given me the opportunity to develop my skills and broaden my horizons. Now I can understand the various needs of in-house corporate clients, law clients, technology and how it all fits together. This has been my biggest accomplishment as I am able to better serve my clients because I can see holistically across the whole organization. That’s reflected by the fact that in the last four years I’ve gone from assisting no Fortune 500 clients to assisting dozens. What advice would you offer a candidate applying for a role at Consilio? Consilio works at a fast pace and there’s no time to be passive. So you must make sure you want to challenge yourself every day and be around experts in your field. As well as wanting to push yourself forwards, you must also have an interest in a client-facing job as a lot of what we do is building relationships directly with clients. At times that can be exhausting, but mostly it’s rewarding and fulfilling, knowing you’re working with a company that’s leading the charge in the eDiscovery and legal consulting space. What are your favorite True North values? All of our True North values are important, but Agility, Passion, Vision and Collaboration stand out the most for me. Ultimately, our jobs and the cases we manage for different clients are not all the same, so we need to be agile and have vision to appropriately assess our clients’ needs. Collaboration and people are critical, since it takes the full team, usually dozens of people (forensics, project management, analytics, review, data, operations, etc) providing their expertise, in tandem to keep a project humming. Lastly, it would all stop without passion and having pride in the work we’re doing. I feel that passion every day from my colleagues and I know that we’re giving 110% on each matter. Marin Eckelberg tells us what it’s like to work on Consilio’s finance team. What is your job title, and which department are you in? I am a Financial Analyst in the Finance department. I work in the Washington, DC office. More than two years – I started at Consilio in 2016. So, what’s a typical day like in your role? My days are usually filled with updating monthly financial reports for the business and creating reports for individual managers throughout the company so they can see how the company is performing. Lately my job has been highly focused on integration efforts. A decent level of industry knowledge is helpful given our many product offerings and the context that data provides. Attention to detail is crucial within my role as an analyst, as are communication and organization skills. Not only is our department fast paced, but we also deal with several employees across the organization. It’s important to be adaptable. For me, working alongside highly skilled professionals and seeing the difference in their working and management styles continuously intrigues me; there are a lot of smart and talented people at Consilio. My position has exposed me to all aspects of this business and has provided an environment of learning and a community that works hard together. What do you feel is the most challenging aspect of your role? As we are a vastly growing company, the way we function changes intermittently and causes the way I do my job to be different from one day to the next. Therefore, my role has grown and has certainly transformed throughout my time with the company. This is also something that is intriguing about working for Consilio. There’s never a dull moment. What has been your biggest highlight of working at Consilio? The culture is positive and forward-thinking. We are all here to help each other and I really enjoy that about my colleagues. For me, the people I get to work with are the best part of the job. Candidates must be able to adapt to a moving target; flexibility is a crucial part of the job as external decisions often impact projects, being able to accommodate these changes is key. Another element for candidates to bear in mind is how much we value our team contributing thoughts and ideas as to how we can do better for our clients, so although it isn’t a necessity for the job itself, speaking up is really valued. Tina Edwards, a Corporate Recruiter, tells us what it’s like to work in Consilio’s HR Department. I currently work in the HR Department but have been fortunate enough to have held many different jobs here at Consilio. I have been working for Consilio for 17 years and am based out of our El Paso office in Texas. I have a wide range of general administrative tasks to complete daily such as reviewing résumés, data entry and updating the job listings. I would say about 90% of what I do is on the phone because I am often doing telephone interviews, sourcing potential candidates and reaching out to those that have applied. However, my main focus is on candidate relationship management. I need to develop a relationship with the candidates from the get go, make them feel comfortable and making sure they are a good fit for Consilio. I also have regular meetings with the hiring managers to discuss candidates and progress their applications to the next stage. Being able to multi-task and have good time management is very important because the days can be quite fast paced with a lot to do. So, having an effective, but realistic, plan for your days and weeks is essential. The best skill to have when working in the HR department, however, is being a people person. I speak to a lot of different people every day and so being a good communicator and having empathy is crucial. I have to build relationships with people who have different personalities and dynamics, so the ability to get along with everybody is essential. Without a doubt, the people are the most interesting part of my job. I love talking to people and I am so fortunate to be able to communicate with different people inside and outside of the Consilio network. It’s an exciting time to be a part of the Consilio family because the business is growing, but it hasn’t left its employees’ interests behind. We still feel really engaged and interested, as self-growth is encouraged. Making sure that candidates are a good fit for Consilio, but also making sure Consilio is a good fit for the candidates, can be tricky. I want to help people get a job and pursue their dreams, but if they don’t have the experience or skills we’re looking for, or if they just won’t fit into the culture here, then it won’t work. What is your biggest highlight from your time at Consilio? It would have to be the many opportunities to grow that I’ve been given. It feels really good to know you’re valued and appreciated and that your employer sees the potential in you. I have done a little bit of everything here at Consilio and I am very fortunate because I have been able to move around a lot and build new skills as I become a better version of myself. Being flexible and ready for change is a great help. The eDiscovery industry is changing rapidly, so if you’re willing to adapt and be open to that change, you’ll be in a really good position to do well here at Consilio. What are your favourite True North values? My two favorites are the Collaboration and the People. The value we place on teamwork and the open-door policy we adopt makes Consilio a great place to work. I know that my colleagues have my back, just like I have theirs, and they will always be there to listen to me and offer advice if I need it. That has created a really great atmosphere and culture because I wake up every morning and am happy to go to work and the fact that I enjoy my job makes a massive difference. 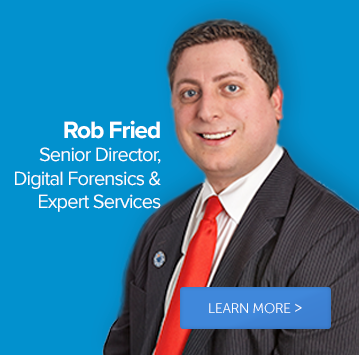 Rob Fried, Senior Director, tells us what it’s like to work in Consilio’s Digital Forensics and Expert Services department. I work in the Digital Forensics and Expert Services department and I am based in our New York office, which is right on Wall Street. Every day is different for me here at Consilio. Generally though, my role involves providing thought leadership, being a team leader, overseeing active projects and supporting the sales organization in business development and bringing in new work. More generally, every day I interact and collaborate with different internal teams and departments throughout the firm in regard to project management, data operations and finance. As technology is always changing, it is important to stay well informed and stay on top of current trends in the industry. The more we are informed, the better we can service our clients. It’s also vital to be as responsive as possible when a client need arises because if we don’t respond quickly, someone else will. We are connected in so many ways now, through email, telephone, texting, etc, that communication is instantaneous. I believe effective communication is the key to success. People want to know that you understand their issues and concerns and that you’re going to take steps to lay out a plan to help their situation, so that’s important too. What intrigues me the most is the ability to assist clients in need. It is a very rewarding and humbling experience, especially when they may find themselves in difficult situations. Internally, my role provides me the opportunity to mentor team members in varying stages of career development. It’s inspiring to watch a person grow professionally as I share my knowledge and experience with them. We’re a fast-paced and growing company with many domestic and international requests coming in, so we have to prioritize tasks effectively, whilst also understanding our clients’ expectations. Sometimes, it takes a little bit of juggling to manage multiple things, however, with the support of team members, we can accomplish a great deal and keep all the plates spinning. Having started in an associate role and now as a Senior Director in a leadership role, I have had the opportunity to understand what it takes to advance in my career. I have also achieved industry certifications in the forensic world and private investigator licenses, which have allowed me to expand my skillset to better serve our clients. Additionally, it’s a big accomplishment of mine to be able to educate others. I’ve been involved in developing and participating as an instructor for our internship programs. It’s great to see the amount of information they obtain during the sessions and I’m proud to be a part of a program that encourages the next generation to learn and appreciate our industry. I interview a lot of people and I would say it is really important to understand that we are a client-facing organization, so we have to provide excellent service and go the extra mile for our clients. It will help you a lot if you create your own brand that allows you to stand out. Find a niche, something that you are passionate about and can develop an expertise in – this will make you the go-to-person and can help kickstart a successful career. What is your favorite True North value? Excellence. I have always given 110% to everything I do and going that extra mile for the team and the firm’s clients. I come to work every day with the same attitude I had when I started 11 years ago. Every day is a rewarding experience and being part of a great environment where there is an opportunity to shine and allow our expertise to be appreciated both internally and externally with our clients is great.